If you want a real small-town environment, Cave Creek real estate may be the way to go for you. The city has a population of only a few thousand, so there is a community rather than large city feel. The Sonoran Desert surrounding makes for a beautiful, Arizona landscape, something lost on many of the larger towns, and the city maintains a naturalistic, western mood. Cave Creek is a beautiful town situated in the Sonoran Desert. It sits adjacent to the town of Carefree and they both share the landmark of Black Mountain. There is a beautiful creek that run through the town, which some think gave the town its name. There are plenty of things to do in this beautiful town, including shopping, dining, and outdoor recreation. There are many beautiful homes in the area and the majority are single family homes, but there are other options for those looking for something different. The median home value is $545,200. The home value rate has risen by 4.3% in the past year and it’s predicted to rise by another 3.4% in the coming year. 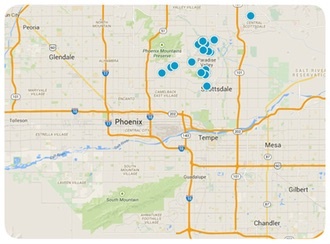 The median price per square foot is $221 and this is higher than Phoenix Metro’s median of $124. Whether you are looking for a Cave Creek condo, ranch, or home, the Russell Shaw Group can find a property you will love. With us, you know you have the inside track to the freshest listings of new homes, so you will hear about any newly listed Cave Creek properties before anybody else! Additionally, you will find our real estate agents are one of the most valuable resources during every step of the home buying process. If Cave Creek real estate is an investment you want to make, let us know today so we can get started searching for your new home.